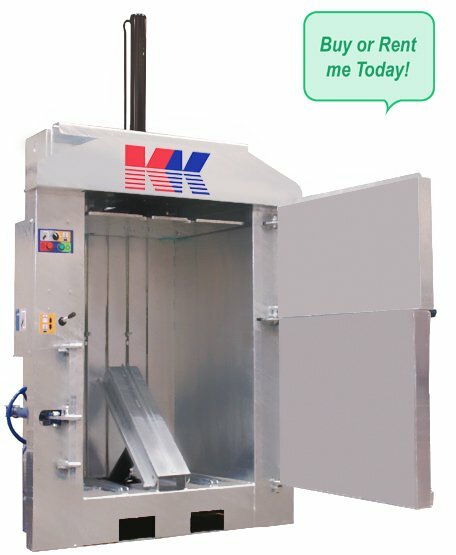 The KK 15 is a mid-range baler suited to companies generating around a tonne of card/plastic per week. Its large loading aperture with side opening door enables bigger boxes to be thrown in without having to break them down. Unlike the smaller models the KK15 is fitted with an auto-eject mechanism, making light work of bale ejection onto a pallet for removal by pallet truck or forklift. This model is also versatile in being able to compact numerous materials into neat bales. A platform can also be supplied in order to crush cans. The KK 15 can be purchased or hired on variable terms. Please contact for further details. PLC panel with automatic compaction cycle and bale full light. Available in either 110/380/400 volts power supply.